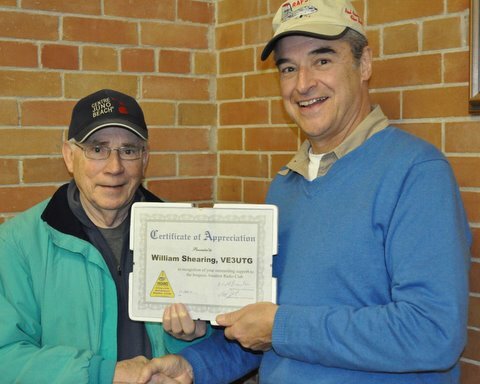 club President Mike Pinfold, VA3TUF, presented Bill with a Certificate of Appreciation for his many years of outstanding support to the Iroquois Amateur Radio Club. Bill Shearing is the Emergency Management coordinator for five Townships surrounding the city of Cornwall. Emergency situations long before he got his ticket. We ran a course for new hams in conjunction with the Cornwall club The Seaway Valley Amateur Radio . They provided a bevy of excellent instructors and Bill took the course and passed the exam to get his licence on March 3rd of this year. Do you have any pictures of this Hamfest? ?